"Miller the Killer" with 5 as DCC secure huge win! DCC win in nervous fashion. Dorking welcomed Malden Wanderers to Pixham Lane and on what looked a very green wicket, Dorking captain Toby Blood won the toss and put the visitors into bat. Opener Andrew Miller could not have started any better with opener Butler having his middle stump ripped out of the ground first ball of the game!! Miller and Travis bowled well and immediately the pressure was on the visitors. Travis then took the next two wickets, with the young 17 year old cleaning up the dangerous Wilson and Young. The score was 58-3 and Dorking knew they needed to keep the pressure on as the wicket was not going to get any better. 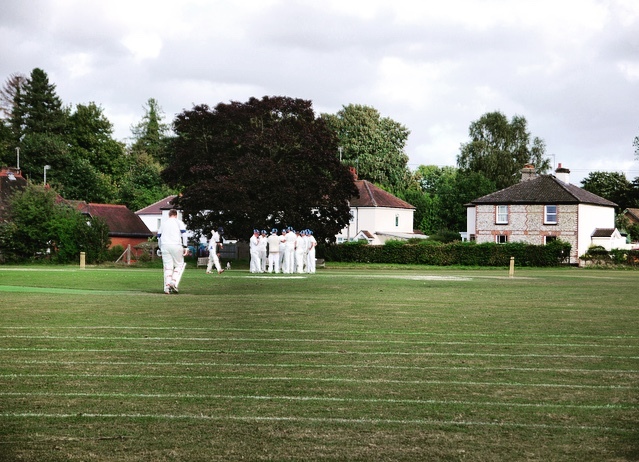 Coupled with inspired field placings, secure catching and threatening bowling Dorking suddenly had the opposition 66-8 with Miller striking regularly and Henry Glynn taking two crucial wickets. Miller bowled 14 overs straight through and claimed figures of 5-22 which is some going. It was turning out to be a match winning spell, just when Dorking needed it. The final two wickets fell shortly after the drinks break with Miller ripping through Coterell and Swift picking up the Dangerous Lavender with a superb catch from young Travis on the boundary. Malden were all out for 92, but Dorking knew the job was only half done. In reply, Dorking got off to a shaky start losing Overton (8) early to Coterell. It was a case of digging in for the Dorking batsman as there were 70 overs to bat. The score moved to 21 with no alarm but suddenly Dorking had a very familiar collapse with 3 wickets falling for no runs. Chave, Rogers and Pitt were the batsman to head back to the pavillion. Rogers quoting, "I must have got a good ball because I missed it". Enough said!! Calm was needed and with Swift and Henry Cameron at the crease Dorking knew the game was still theirs if they could put a partnership together. The pair survived until tea with the game evenly poised at 47-4. Dorking were half way there but quick wickets and the game could turn. A flurry of runs game after Tea but when Swift (26) and Miller fell in the space of two balls Dorking were left 60-6 still with 33 runs to get. The lower order were frantically padding up with captain Toby Blood going to the crease to join Henry Cameron. Henry was playing a very sensible and mature innings and if he stayed there, Dorking knew they would win. In true Blood style, attack was the best form of defence and suddenly the score was racing along. Coupled with a huge blow from Henry over mid wicket Dorking were suddenly 10 short. Blood was bowled from a no ball much to his relief and struck the next two balls for 6 and 4 to see Dorking over the line. Henry finished on 21 not out (which felt more like 50 given the circumstances) and captain Blood finished on 23 from 15 balls. A huge win given all the results in the league! 7 crucial games to go! All to play for!